This is a review of a three night cruise out of Southampton, England. The itinery included calls at Zeebrugge, Belgium and Le Harve, France. Explorer of the Seas is an old friend. We have sailed on her several times and enjoyed it each time. Thus, we were looking forward to seeing Explorer again. Of course, there is always some trepidation about seeing an old friend who you have not seen for awhile. People change over time and you and your friend may no longer have much in common or enjoy the same things. Ships change too and so the same basis for concern is there. While Explorer has changed, she remains an enjoyable cruise experience. Indeed, it is not too much to say that the ship is in top form. For nearly a decade, Explorer of the Seas was Royal Caribbean's New York ship based in Bayone, New Jersey, which is on the New Jersey side of New York harbor. Other Royal Caribbean ships have taken over that role and Explorer is now doing what her name suggests - - exploring the world. In the summer of 2015, she is sailing from Southampton. When her British season ends, she will sail around Africa to Australia. After a season down under, she will cross the Pacific and then cruise to Alaska. Sailing out of New York yearound takes a toll on a ship. Accordingly, before undertaking her exploration of the globe, Explorer recently underwent a massive revitalization in Cadiz, Spain. In addition to sprucing the ship up, new features were added including new specialty restaurants and a Flowrider surfing simulator. As a result, the ship looks clean and fresh. The décor has been changed and is somewhat more restarined than before. For example, the nearly life size statue of Elvis that was in the casino has disappeared. Similarly, the facades on the Royal Promenade (the ship's street-like indoor mall) have a more conservative upscale look. This is not to say that Explorer has abandoned the type of cruise experience that she offered in the past. There are at least four Royal Caribbean cruise experiences. There is the more traditional cruise experience of the smaller Vision and Radiance class ships. At the other end of the size spectrum, the Oasis class ships offer a new model of cruising with an unmatched amount of good quality dining and entertainment choices. Anthem of the Seas offers a more serious, upscale and cutting-edge experience. The Freedom and Voyager class ships provide a big ship experience with lots of action, fun and features. Despite the changes, Explorer remains a true Voyager class ship - - big, fun and good quality. The programming remains the same. There are just more features than before but less flash and whimsy in the presentation. As a result of the revitalization, guests now have more dining choices. Until the revitalization, Explorer had only one specialty restaurant, Portofino's, in addition to the main dining room. Portofino's has been replaced with the Chops Grille steakhouse. Giovanni's Table, a somewhat different take on Italian cuisine than Portofino's, occupies the space that was once the upper level of the ship's underutilized Gothic-style nightclub. Asian-inspired Izumi is where the card room once was. Each of the restaurants has been decorated in its own contemporary style. In addition to offering more choices, the taste of the food on Explorer has improved. As indicated earlier, we have sailed on Explorer several times. The food was usually good but not outstanding. On this cruise, we had dinners in Chops Grille and Giovanni's that were excellent. Also, on the one one night that we dined in the main dining room, the meal was quite good. No voyage on Explorer would be complete without a lunch at Johnny Rockets. The extra-tariff American style diner specializes in such things as cheeburgers, chile cheese fries, sundaes and sodas. While fans of healthy dining may feel guilty about eating such things, the items taste so good and the presentation is such fun. On this voyage, Johnny Rockets did not open until three in the afternoon as each day was a port day. Despite this and despite the fact that the vast majority of the passengers were British, Johnny Rockets was packed as soon as it opened with a substantial queue waiting to enter. Nonetheless, the waiters remained friendly and even did their line dance to a 1960s hit. Several other cruise lines now have premium burger venues (e.g., Guy's Burger Joint (Carnival); Uptown Grill (Norwegian), Dive-In Burgers (Holland America). Thus, there is competition for the title of best burger at sea. (Indeed, the healthy choice Little Dev burger on Anthem of the Seas is also a contender). But Johnny Rockets on Explorer is still worthwhile because it combines good food with an entertaining presentation. The service in each of the restaurants was quite good - - attentive and friendly. Our stateroom attendant seemed disappointed when we said that we could not think of anything more that he could do for us. Indeed, everyone seemed to be customer-focused. Almost all of the passengers on this cruise were British. 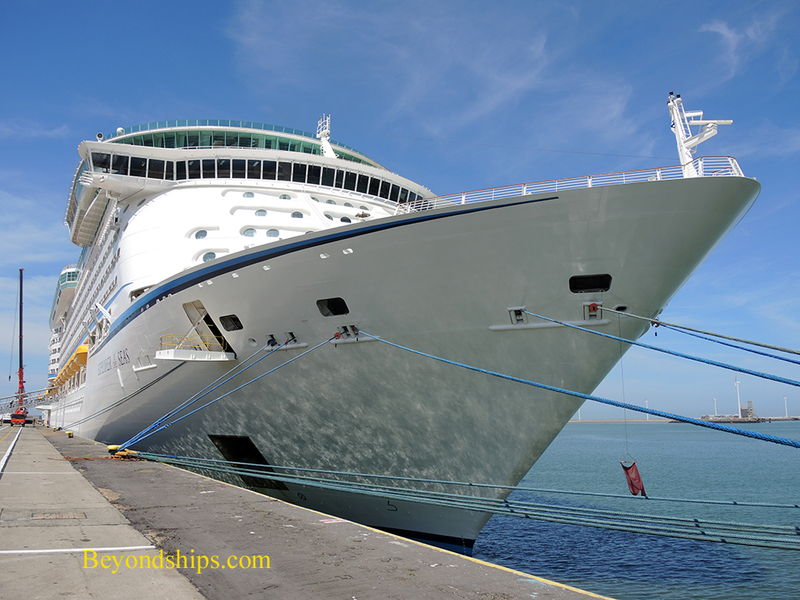 Even though the cruise experience offered is quite unlike traditional British cruising, Royal Caribbean has developed a substantial following in Britain. Indeed, the British are particularly fond of Independence of the Seas, a Freedom class ship, which is not at all traditional. This is Explorer's first season in Britain. The Freedom class ships are an extended version of the Voyager class and so people who like Independence should also like Explorer. Not content to rely on this family relationship, Explorer is coloring her cruise experience to please British guests. This ranges from having tea kettles in the staterooms to having British favorites available in the buffet to playing a medley of Land of Hope and Glory, Rule Britannia, Jerusalem and God Save the Queen during the sailaway. Inasmuch as this was a short cruise during a holiday weekend, many of the guests were young people. There were several groups of women wearing sashes saying that they were traveling as part of various “hen dos.” Similarly, there were several bachlor parties. Young families with children were also in evidence. A short cruise is often a party cruise. More guests than usual elected to stay on the ship in the ports and lay by the pools during the day or frolic in the Flowrider. There was drinking but no bad behavior. Each evening, the ship put on a show in the main theater. This included a production show by the ship's singers and dancers as well as a show by visiting British comedian Tucker, which was very well-received. Also receiving praise from a large number of guests was the Spirits of the Season show in the ship's ice rink. Essentially, this was a production show on ice with music, correographed skating, costumes and theatrical lighting. On the second night, the cruise staff staged a street party in the Royal Promenade. Entitled “Britain Rocks,” the staff wore British costumes and led the dancing to various traditional British songs and popular hits. During the day, there were trivia quizes as well as a movie each afternoon. On the open decks, there were activities such as surfing lessons. Since each day of the cruise was a port day, there were fewer daytime activities than on a longer cruise that included sea days.